Texas wargamer and master terrain builder Jim Dunnam has been working for some time to create terrain boards for the southern part of the Gettysburg battlefield for use in his 15mm ACW gaming. He has periodically posted photos of his progress, and the terrain for Little Round Top and Devil’s Den is now complete. Terrain boards for McLaw’s and Anderson’s attacks are underway. Check out his sweet-looking layout!!! Click on the thumbnail for a detailed look at this sample flag. Your tabletop is ready, with well constructed terrain, nice looking fences, and nicely painted buildings. You deploy your miniature armies – correct in their paint schemes and colors, and with a paint quality that looks good from two feet away or closer. Everything looks good, and you are ready to impress your fellow gamers, except for those scraggly excuses for flags that you tried copying off some generic Internet image, or those metal flags you so badly painted. You need new flags – good looking flags – that will match the quality of your troops and terrain. 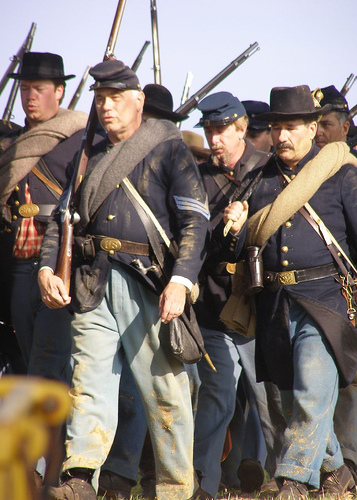 The Old Gunny, Tim Harrop of Gaithersburg, Maryland, has such flags for your consideration, taken directly from the Civil War collections of several leading museums. And, to sweeten the pot, Tim will donate a percentage of his gross sales directly to Civil War and historical flag preservation. Now, that’s a deal worth a hard look! The Old Gunny’s Flags submitted some 25mm flags for review, but Tim also makes them in other scales from 10mm to 54mm. He has access to the extensive flag collections of the states of Maryland, Massachusetts, Connecticut, and the Museum of the Confederacy, and has taken great pains to accurately replicate these flags’ ACW appearance in miniature. Plans are to add the flags of North Carolina units next, with others in the future as museum directors allow access. The flags are printed on a high resolution color laser printer and are quite detailed. 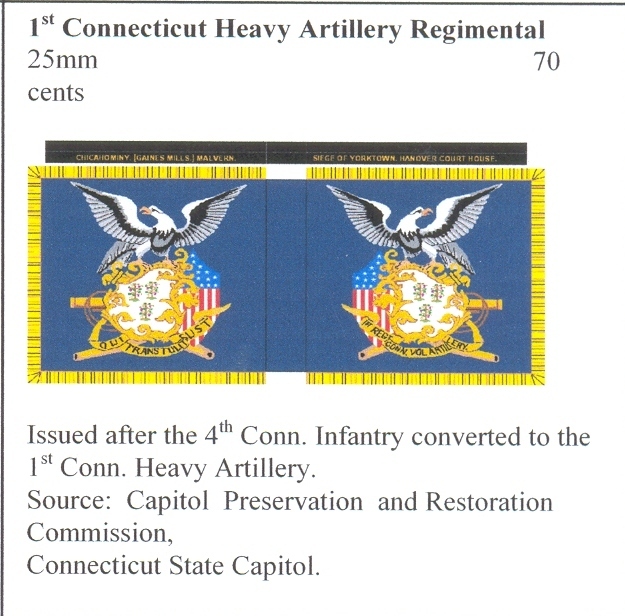 For 25mm, they range from .35 to .70 cents U.S. for each flag ordered; for 15mm, this drops to .25 to .50. Other sizes available are 54mm, 40mm, 30/28mm, 20mm, and 10mm, with a sliding scale for pricing. Since they are based directly from extensive observations of the actual flags in the collections of leading museums, they are perhaps the most accurately depicted miniature Civil War flags available on the market. Printed on high quality paper, they come ready to be cut out and glued into place around the flagstaffs. Each flag also comes with a short history and an acknowledgement of where the original flag is now located. The Old Gunny’s Flags can be reached at 107 Woodland Road, Gaithersburg, Maryland, 20877, or at Gysgt0848@aol.com. Tim will gladly send you a full catalogue of what he currently has available for sale. I would like to wish each Cannonball reader a safe and pleasant holiday season! We are spending much of today at my daughter’s house for a family get together, and then enjoying Christmas at our house tomorrow. Few Civil War soldiers had the privilege of spending the holidays at home with their loved ones and friends. Christmas for Civil War soldiers was usually a very tough time – they were away from home, cold, often hungry, and missing loved ones and fallen comrades. In 1864, Lieutenant Elisha Hunt Rodes of the 2nd Rhode Island Infantry wrote, “I should like to be home this Christmas… This is the birth of the Saviour, but we paid very little attention to it in a religious way.” With much sadness, he closed, “This is my fourth Christmas in the Army. I wonder if it will be my last.” It was. By the next year, the war was over and Rhodes was indeed home. Times have not changed. A number of you have loved ones serving overseas this Christmas, and, like their counterparts of the Civil War, boxes of goodies from home are the soldiers’ lifelines to their homes. Take time to remember our troops this holiday season. Like Elisha Rhodes, many are hoping to be home this time next year. Civil War gamemasters wanted for Cold Wars convention! Cold Wars Is Closer Then You Think! And last but not least we are looking for presentations, workshops and other events for the Terrain University . Contact me directly with events that fit this category. Anything from how to address visual perspective to making realistic snow. If you have a technique or special process for addressing terrain why not share that knowledge with your fellow gamers? Cold Wars 08 Promotion Manager. For those Cannonball readers in the southern Pennsylvania / northern Virginia / eastern Maryland tri-state region, the Harford Area Weekly Kreigsspielers is sponsoring a regional mini-convention which I plan to attend. 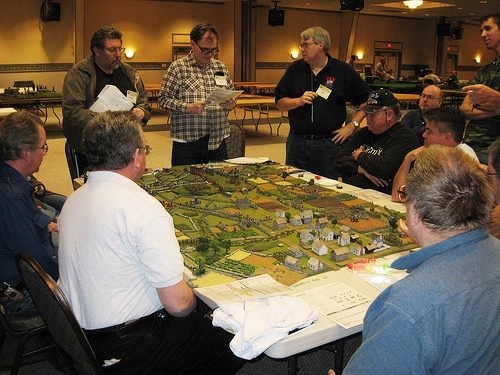 HAWKS is a non-profit wargaming group in Harford County, Maryland, in the greater Baltimore area. They are sponsoring BARRAGE XII, a one day convention on January 19, 2008. The event will be held at the Archbishop Curley High School, a short distance northeast of downtown Baltimore out in the suburbs, with easy access to the Beltway (I-695) and I-95. The point of contact for BARRAGE XII is Geoff Graf at ggraff7@verizon.net or phone (410) 557-2456. There will be miniature wargames of all genres and historical periods. I attended last year’s convention, driving down from York, PA while listening to the 2nd South Carolina String Band on my car’s CD player. The high school was very easy to find and the staff friendly and courteous. I sold a lot of copies of my Human Interest Stories of the Gettysburg Campaign, Volume 1, and had a good time chatting with old friends. Among the gaming highlights was Rich Hasenauer‘s 15mm Mexican-American War game of the Battle of Palo Alto, using Regimental Fire & Fury rules. Why not stop by this mini-con if you live in the area or happen to be in Baltimore for business or pleasure that weekend?